In exclusive interviews, photos and research, The Associated Press has documented and mapped 72 of the mass graves, the most comprehensive survey so far, with many more expected to be uncovered as the Islamic State group's territory shrinks. In Syria, AP has obtained locations for 17 mass graves, including one with the bodies of hundreds of members of a single tribe all but exterminated when ISIS extremists took over their region. For at least 16 of the Iraqi graves, most in territory too dangerous to excavate, officials do not even guess the number of dead. In others, the estimates are based on memories of traumatized survivors, Islamic State propaganda and what can be gleaned from a cursory look at the earth. Still, even the known victims buried are staggering — from 5,200 to more than 15,000. Sinjar Mountain is dotted with mass graves, some in territory clawed back from ISIS after the group's onslaught against the Yazidi minority in August 2014; others in the deadly no man's land that has yet to be secured. The bodies of Talal Murat's father, uncles and cousins lie beneath the rubble of the family farm, awaiting a time when it is safe for surviving relatives to return to the place where the men were gunned down. 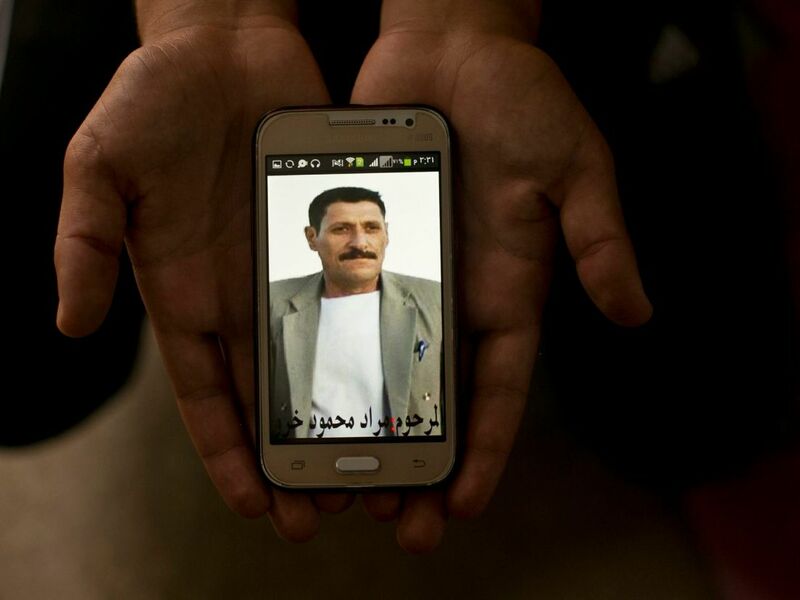 On Sinjar's other flank, Rasho Qassim drives daily past the graves holding the bodies of his two sons. The road is in territory long since seized back, but the five sites are untouched, roped off and awaiting the money or the political will for excavation, as the evidence they contain is scoured away by the wind and baked by the sun. "We want to take them out of here. There are only bones left. 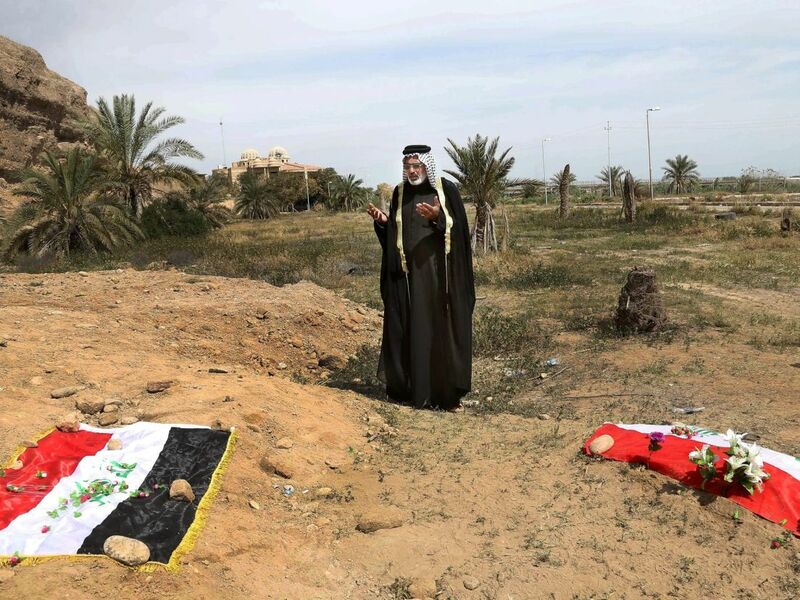 But they said 'No, they have to stay there, a committee will come and exhume them later,'" said Qassim, standing at the edge of the flimsy fence surrounding one site, where his two sons are buried. "It has been two years but nobody has come." ISIS made no attempt to hide its atrocities. In fact it boasted of them. But proving what United Nations officials and others have described as an ongoing genocide — and prosecuting those behind it — will be complicated as the graves deteriorate. "We see clear evidence of the intent to destroy the Yazidi people," said Naomi Kikoler, who recently visited the region for the Holocaust Museum in Washington, D.C. "There's been virtually no effort to systematically document the crimes perpetrated, to preserve the evidence, and to ensure that mass graves are identified and protected." Then there are the graves still out of reach. 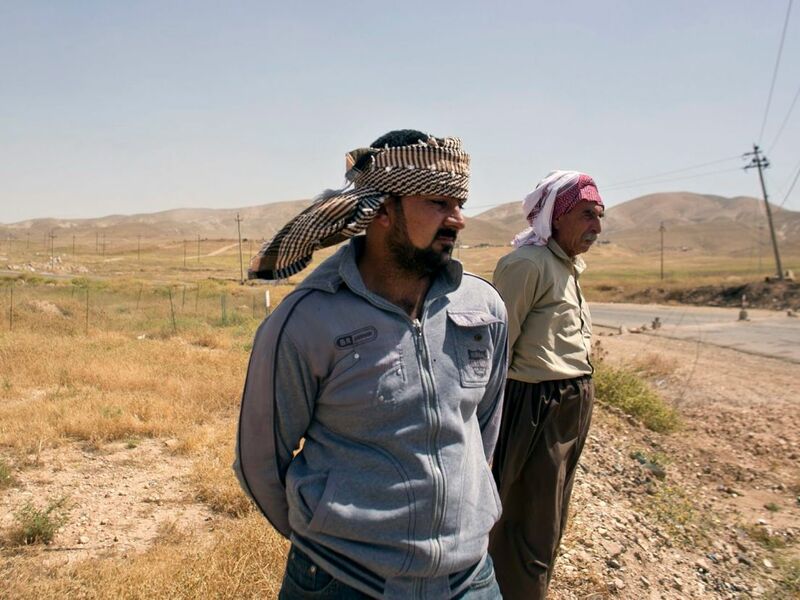 The Islamic State group's atrocities extend well outside the Yazidi region in northern Iraq. Satellites offer the clearest look at massacres such as the one at Badoush Prison in June 2014 that left 600 male inmates dead. A patch of scraped earth and tire tracks show the likely killing site, according to exclusive photos obtained by the imagery intelligence firm AllSource Analysis. On the northern flank of Sinjar Mountain, five grave sites ring a desert crossroads. It is here that the young men of Hardan village are buried, under thistles and piles of cracked earth. They were killed in the bloody ISIS offensive of August 2014. Then the killings began. The first night, Arkan saw the militants line up a group of handcuffed men in the headlights of a bulldozer at an intersection, less than a kilometer down the slope from Gurmiz. They gunned the men down, then the bulldozer plowed the earth over their bodies. Over six days, Arkan and his comrades watched helplessly as the fighters brought out three more groups of men — several dozen each, usually with hands bound — to the crossroads and killed them. He didn't always see what they did with the bodies. One time, he saw them lighting a bonfire, but he couldn't see why. Now, since ISIS fighters were driven out of the area, the 32-year-old has returned to his home. But he's haunted by the site. 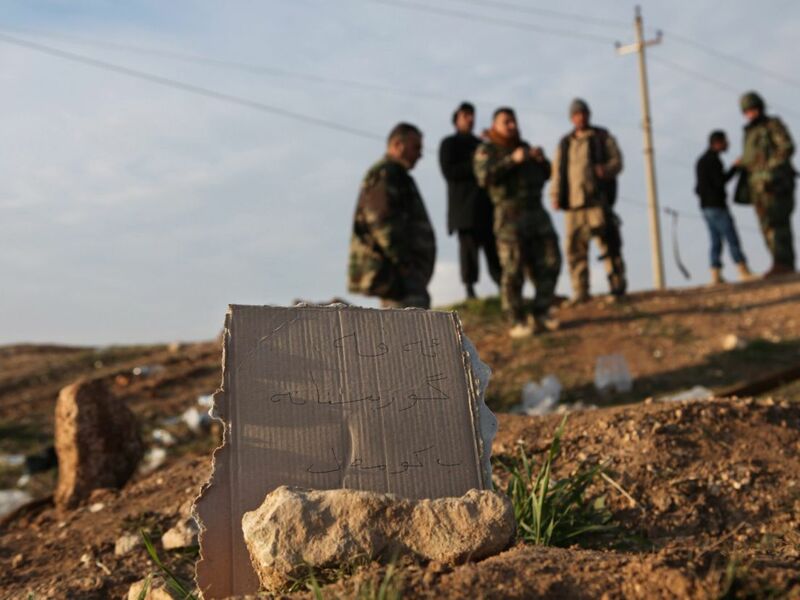 As documented by the aid group Yazda, which has mapped the Sinjar sites, the graves are in a rough pentagon flanking the crossroads, largely unprotected. Around one of them is a mesh fence and a wind-battered sign. As Arkan spoke at the site, a shepherd herded his flock nearby. "I have lots of people I know there. Mostly friends and neighbors," he said. "It's very difficult to look at them every day." 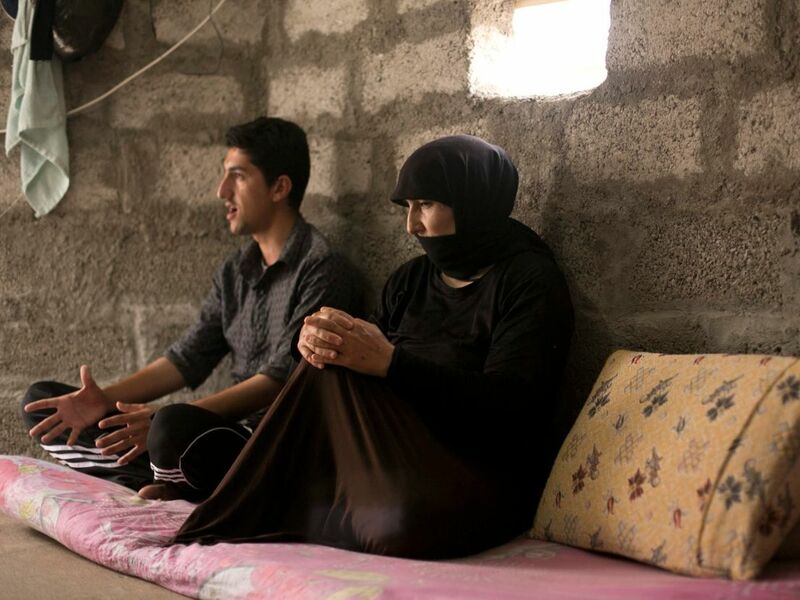 "This body is wearing my father's clothes"
As ISIS fighters swarmed into the Sinjar area in early August 2014, Talal Murat fled his town along with his father, mother, four sisters and younger brother. They and dozens of other men, women and children from his extended clan converged on an uncle's farm outside the town of Tel Azer. They prayed it was remote enough to escape the killings that were already engulfing so many Yazidis. The Yazidi faith, one of the region's oldest, has elements of Christianity and Islam but is distinct. Yazidis worship the Peacock Angel, fallen and forgiven by God under their tradition, and their shrines feature carved images of the birds and references to the sun. Muslim extremists condemned them as "devil worshippers" and over the centuries have subjected them to multiple massacres – 72, by the Yazidis' count. Then they lined the men and teenaged boys against the wall of the stables — around 40 in all, including Murat. There were too many of them, too bunched up, to efficiently mow down, so the fighters then ordered them to lie on the ground in a row, Murat said. That was when his uncle told him to make a run for it. Murat bolted into his uncle's hayfield, as did several other men. The militants fired at them, and the bullets ignited the hay, dry from the summer sun. The fire covered Murat's escape, and he took shelter in a nearby creek. Nouri Murat, Talal's mother, found her husband. His body was untouched, but his head was shattered. Her daughters, she said, were confused at first. "This is strange, this body is wearing my father's clothes," one of them said. As Nouri frantically searched around the property for any surviving menfolk, her nine-year-old daughter Rukhan lay down beside her father's corpse. As they began the long walk north, Nouri noticed Rukhan's bloody fist. Fearing her daughter was wounded, she pried open the girl's clenched fingers. Inside were a handful of her father's teeth. Nearly every area freed from ISIS control has unmasked new mass graves, like one found by the sports stadium in the Iraqi city of Ramadi. Many of the graves themselves are easy enough to find, most covered with just a thin coating of earth. "They don't even try to hide their crimes," said Sirwan Jalal, the director of Iraqi Kurdistan's agency in charge of mass graves. "They are beheading them, shooting them, running them over in cars, all kinds of killing techniques, and they don't even try to hide it." No one outside ISIS has seen the Iraqi ravine where hundreds of Shi'ite prison inmates were killed point blank and then torched. Satellite images of scraped dirt along the river point to its location, according to Steve Wood of AllSource. His analysts triangulated survivors' accounts and began to systematically search the desert according to their descriptions of that day, June 10, 2014. The inmates were separated out by religion, and Shi'ites were loaded onto trucks, driven for a few kilometers and forced to line up and count off, according to accounts by 15 survivors gathered by Human Rights Watch. Then they knelt along the edge of the crescent-shaped ravine, according to a report cited by AllSource. "I was number 43. I heard them say '615,' and then one ISIS guy said, 'We're going to eat well tonight.' A man behind us asked, 'Are you ready?' Another person answered 'Yes,' and began shooting at us with a machine-gun. Then they all started to shoot us from behind, going down the row," according to the Human Rights Watch account of a survivor identified only as A.S. The men survived by pretending to be dead. Using their accounts and others, AllSource examined an image from July 17, 2014, that appeared to show the location as described, between a main road and the railway outside Mosul. The bodies are believed to be packed tightly together, side by side in a space approximately the length of two football fields end to end, in what the AllSource analysis described as a "sardine trench." Tire tracks lead to and from the site. "There's actually earth that has been pushed over and actually moved to cover parts of the ravine. As we look across the entire ravine we only see that in this one location," said Wood. "Ultimately there are many, many more sites across Iraq and Syria that have yet to be either forensically exhumed or be able to be detailed and there's quite a bit more research that needs to take place." The key, Wood said, is having photos to indicate a grave's location taken soon after its creation. 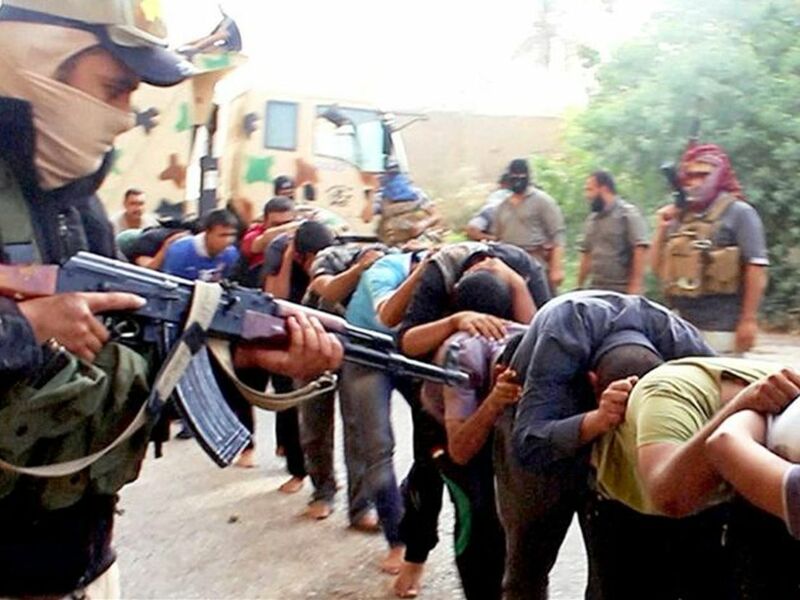 Justice has been done in at least one ISIS mass killing – that of about 1,700 Iraqi soldiers who were forced to lie face-down in a ditch and then machine-gunned at Camp Speicher. On August 21, 36 men convicted in those killings were hanged at Iraq's Nasiriyah prison. But justice is likely to be elusive in areas still firmly under ISIS control, even though the extremists have filmed themselves committing the atrocities. That's the case for a deep natural sinkhole outside Mosul that is now a pit of corpses. In Syria's Raqqa province, thousands of bodies are believed to have been thrown into the giant al-Houta crevasse. Conditions in much of Syria remain a mystery. Activists believe there are hundreds of mass graves in ISIS-controlled areas that can only be explored when fighting stops. By that time, they fear any effort to document the massacres, exhume and identify the remains will become infinitely more complicated. Working behind ISIS lines, local residents have informally documented some mass graves, even partially digging some up. Some of the worst have been found in the eastern province of Deir el-Zour. There, 400 members of the Shueitat tribe were found in one grave, just some of the up to 1,000 members of the tribe believed to have been massacred by ISIS when the militants took over the area, said Ziad Awad, the editor of an online publication on Deir el-Zour called The Eye of the City, who is trying to document the graves. In Raqqa province, the bodies of 160 Syrian soldiers, killed when ISIS overran their base, were found in seven large pits. So far, at least 17 mass graves are known, though largely unreachable, in a list put together from AP interviews with activists from Syrian provinces still under ISIS rule as well as fighters and residents in former ISIS strongholds. "This is a drop in an ocean of mass graves expected to be discovered in the future in Syria," said Awad.